The plot sounded really original, and the artwork looked good so I thought I'd give this a try. I regret my decision whole heart. While the summary plot is interesting, the actual plot is completely unrealistic. a 5 year old running a newspaper distribution company? All the characters are pretty flat, with most being simply sexualized stereotypes of lesbians. And the ending makes no sense, and doesn't even bother trying to tie up any loose ends. Honestly I get wanting better LGBT+ representation in anime, but this is just not it. You're better off watching almost anything else. I recommend any and everyone to watch this series. I really enjoyed every episode and the relationships each of the girls have with each other. Very funny and lite. This series needs at least one or two more seasons. We need to see who the new girl is and how life unfolds for Kana and each character as well. I was just looking for something light and cute and came across Kanamemo. It's so cute and sweet. I have difficulty getting through an episode without crying, it's so touching (and I don't mean Haruka). If you're in the mood for this sort of thing, it's wonderful. Yuuki and Yume are so cute together. You warm up to this series after just one episode; the story pulls you in and you want to see how Kana fairs in her new environment and life. Her co-workers are kind, but not overly-gushingly so; to me, for the most part, there was just the right amount of pleasant and plausible interaction. I enjoyed seeing tidbits of Japanese daily life and culture, like newspaper route schematics, public bathing rooms, Obon feastivals, and other things. The yuri couple's interaction was handled sweetly and without all the extravagance and overbearing lewdness that we find in many series. However, there is another character whose pedophilia was just too much; the writers should have toned it down, not so much because of the content but because it became a too-frequent distraction. Character design, artwork, animation, voice acting and sound effects were all average. But the opening theme is catchy and sung very well. The writers probably could have given us another season, but the story as it is ends on a good note. Kanamemo is a light slice-of-life series for the young-teen crowd. I got to mid of ep 5 then decided not to continue watching it...Others may have found it interesting but I did not. Drawing is good, initial episode was sort of funny with Kana mistakenly thought that she will be sold off with her grandmother's belongings, so she ran away...but that was it...I feel like the rest were kinda blah. Personally, I will not recommend it, sorry. I loved it so much I'm re-watching it! Normally after I'm done with an anime I don't re-watch it, but I'm on my second run of the episodes and still love every episode! Very lovable characters and a wonderful story, good character development but not too in depth. Hinata is probably my favorite character next to Chief! Kanamemo - Cute, cute, and more cute. 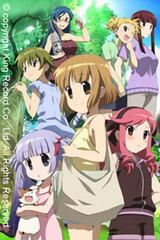 Kanamemo is a comedy possibly yuri anime. It's a hilarious anime. Lots of laugh, and overload on cuteness. It's a fun anime, recommended if you love slice-of-life comedy.